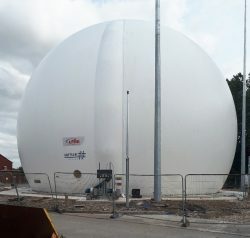 Contracted by Eric Wright Water we recently supplied and installed a Sattler 3200m3 Model B9 125/250 double membrane gas holder for United Utilities. This incorporates duty/standby Zone 1 air blowers with flow control, over pressure valve, gas detection and laser level control. All equipment is supplied in accordance with WIMES 4.01 for coastal location. The gas holder is protected with 4No. lightening protection masts to LPS1, 20mtr rolling sphere method in accordance with BSEN62305, which provides the most effective protection against the possibility of a lightning strike. Commissioning of the package on gas is expected in Q4 2018. This entry was posted in Gas Holders, Latest Utile News by chris. Bookmark the permalink.